Apart from factory dolls, there is a big part of doll collecting that involves re-painted dolls and handmade fashions, either one of a kind or produced in multiple copies. So I decided to feature those talented artists on my blog too, to find out more about their passion, their talent and share tips with you. He is holding a Claire CED doll. Chewin: I started to develop a strong passion and love for art since I was around 6 years old. Art has always been such an important part of my life. I graduated from University with a Bachelor’s Degree of Fine Arts and M.A. in Art History. Also, I love collecting a variety of different dolls and modifying to have a new fashion, and new facial features. This passion runs in my family. Since a young age, my sister, Kittimavadee Malipunte also developed a love and passion for making outfits for dolls. While growing up, we both started collecting dolls from many companies such as Barbie, Madame Alexander, Tonner, Fashion Royalty, Diva Doll, Sybarite and Super Dollfie etc. Chewin's watercolor painting. A similar one graces his business cards. Also, I have many friends who share the same passion for collecting dolls as I do. We would make the outfits for many different types of dolls and sell them to doll stores for only a short period of time. Then after seeing some doll designers from Thailand selling their work worldwide at the auction on the e-bay website, we started to get some new ideas on how we can sell our products to customers that not only live in Thailand, but may live on the other side of the world as well. This posed a few challenges for me, so I asked my sister if she would be willing to make the outfits for the dolls we sell. She agreed to participate which was such a relief! 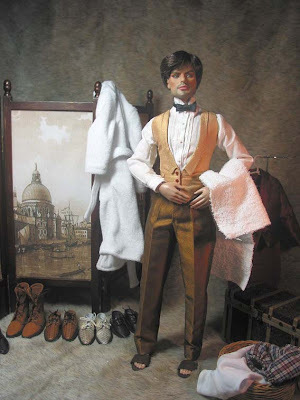 We prefer to create the outfits for male dolls because they are not commonly seen on e bay auctions. And then our first fashion design for Matt O’Neil was shown on e-bay and we were very proud for this to happen. First fashion for Matt from Chewin on ebay. 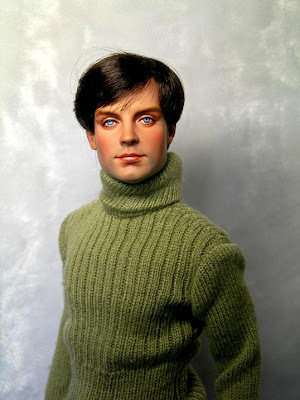 FDC:Which came first-clothes making or doll re-painting? Chewin: In Thailand, I worked on repainting the dolls first. But when I had to prepare the dolls before showcasing them on e bay, we had to work on the fashion aspect first. FDC:When did you first start selling your dolls/clothes? Chewin: I started selling doll fashions in the year 2005, and I began repainting dolls in the years 2006. A Matt O'Neil Tonner re-paint by Chewin. Chewin: One of the biggest obstacles for me is trying to meet the needs of the collectors. Most collectors prefer collecting female dolls as opposed to male dolls. So the demand for male doll outfits is very low. Also, when I showcase my dolls on e-bay, I have to wait for the potential costumer’s feedback on whether or not they are interested in purchasing the product. Their feedback helps explain our products in much more detail, which is actually a much better description than the one I provide on the selling page. Chewin: In the past, I was granted permission to sell the clothing for, and repaint certain types of dolls for Barbie and Tonner here in Bangkok, Thailand. I no longer work on those products because collectors seem to have turned their interests onto Momoko and Pullip dolls instead. This is why I turned to starting my own business on e bay. One of Chewin's creations on a Sybarite doll. Chewin: My inspiration comes from a variety of things that are around me. For example, I am inspired by looking through fashion magazines, watching fashion shows on T.V., movies or even the different types of clothes that people wear around me. For doll repainting, movie stars, super-models, musicians and using my own imagination are all things that inspire me. Chewin's amazing repaint of Tonner's Peter Parker to look more like Toby McGuire. Chewin: There is no specific or set time when it comes to completing clothing for a doll. Each item of clothing takes a different amount of time to complete. Some can be finished in half a day, while others may take 1, 2 or even three days to fully complete. For doll repainting, that process can be finished in roughly 5-8 hours depending on how much detail is needed. 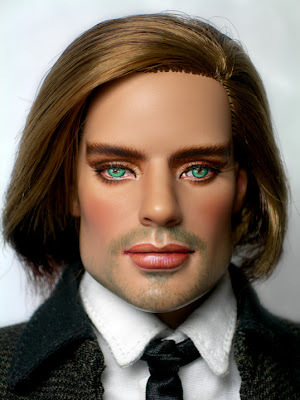 Men dolls are usually much more difficult to complete than women dolls because you have to avoid any detail points that resemble female, such as the eyes, eyebrows, mouth and hair style. For me, to have the opportunity to remake a doll with news looks from the original paint is perfect. This is the end of part 1 of my interview with Chewin. It will continue in the next post, with more photos of his amazing work. Photo credits: Photos of Chewin and his sister, his painting, first matt fashion, Tonner re-paint, Sybarite and Peter Parker all courtesy of Pronchewin Malipunte. Obsidian Society Vanessa photo courtesy of Stratos Bacalis.